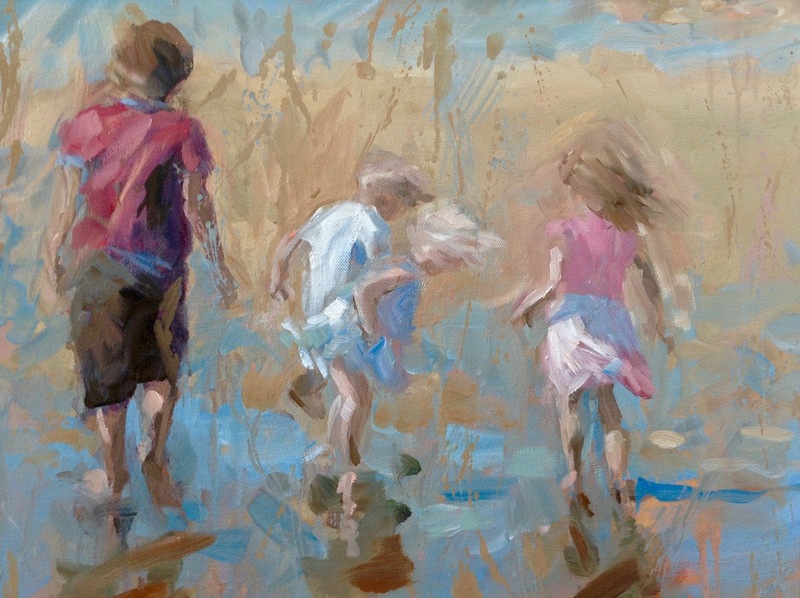 Diary and Doings of Artist Sue McDonagh,based in Cowbridge in the beautiful Vale of Glamorgan. Recent paintings, exhibitions and all the general stuff that goes with being an artist that you never think of. Here I am, faster, stronger, fitter than before and able to leap tall buildings with a single bound five weeks after my operation to fit a second hip replacement - so I've got a matched pair now! If any of you have suffered with arthritis, you don't need me to tell you about it. How it's not only debilitating and painful, it's ageing - and I'm not old: I had my first hip replaced aged 46 - and depressing, and gradually closes your world in, because it's easier to say "No thanks" to invites because it's uncomfortable to sit or walk, and you feel guilty about moaning. Also, people often expect you to have improved - "Oh, isn't that hip any better yet? ", because they can't conceive of a non-life threatening condition that just lingers on, without any of our 21st century quick fixes. Or - worse, they mimic you hobbling down the high street! And laugh! I really don't know how that's meant to make me feel - and I do still have a sense of humour... although I confess it's been a bit strained at times. One of the worst bits is that your flexibility disappears, making getting up and down from the floor impossible. Putting on socks, for example - I'm so glad when it's summer and I'm in sandals! I gradually stopped doing everything I loved. On my last motorbike trip, I physically couldn't climb off my bike. That was September 2014. Cycling went the same way. I could still swim, but the chlorine irritated my sinuses and made me miserable and I was getting enough of that from my hip! But anyone who's seen me hobbling around for the last six months with a stick will know that I still managed to walk the dog - luckily he's older and has learned not to expect to much from me these days. Bending down to pick up his poo was a challenge! But anyway. I'm going to stop talking about the misery of arthritis - but don't forget about it the next time you see someone hobbling about who needs a hip replacement. 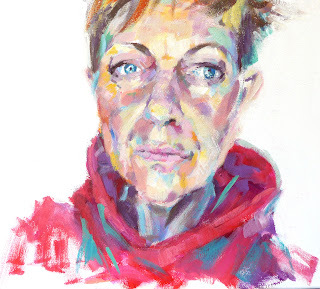 I'm still writing away at my novel, which has been a life-saver whilst immobile - and I finally began to paint again at the end of last week! Yay! Get the flags out! Once I started to paint, I couldn't seem to stop. I painted all day - collapsed after dinner - and then, as I started to think about what I'd painted, I had to get out to my painting studio and crack on with it until bedtime! Painting lifts my soul in a way that nothing else does. I mean - I love my motorbike, I love cycling, I loved windsurfing (haven't been able to do that for quite some time now!) and I really really used to love throwing myself down enormous waves on a bodyboard and a racing surf-ski! Writing satisfies my creative spirit in a similar way to art - but that connection between my soul and my paintbrush is like nothing else. Sometimes - ok, often - and I know I'm not the only artist who feels like this - sometimes I lose faith in myself. I have crises of confidence where I think that everything I paint is rubbish. I've learned now, that this sense of self criticism is a necessary means of pushing myself on - but it's very destructive. When paintings don't progress according to plan, or deadline - I'm really not a nice person to be around. 'Bear with a sore head' doesn't even come close. If only, like Photoshop, I could 'undo' bits that I've overdone, or messed up - go back to just after the beginning, when it all looked so promising..... hahaha. Yeah, right. 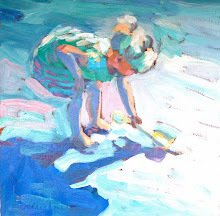 But when a painting seems to be appearing as if by magic out of the end of your paintbrush.... when it seems to be bypassing your brain and takes on a life of it's own......when you look at it later and think, 'how did I do that?' -well, that's worth all the moments of frustration and helplessness in front of a failed painting - and it's what keeps me in front of my easel, when maybe business is slow, or inspiration is lacking, or other distractions lurk. But that's followed by a terrible, crushing feeling and I can't quite get my breath, and I realise that I HAVE to paint. When I sit in the countryside, with my nifty little box of oils, I'm so happy. My body relaxes - it tells me that this is exactly where it wants to be, thankyou. If I get a scrap of paper out of my pocket and make a few marks with a pencil to remind myself of something I've seen, I'm happy. I'm not happy wasting my time, sitting in my studio doing nothing, waiting for possible customers, and I'm not happy being indoors all the time. The last few years - difficult ones due to the illness of a close relative and my deteriorating hip - have underlined my need to 'seize the day'. So my 'halfway through the year Resolution' is to give myself what I need to be inspired, and get out there and paint more often, while there's still some summer left. I still have my lovely van, although I haven't been able to use it in the way I'd planned for over a year now - and as soon as I've bought myself a little step so I can get into it, I'm going to get out there and PAINT. I'm also going to be running some workshops, because the other thing that I miss is other creative people, and I've always enjoyed sharing my knowledge. Absolutely delighted to tell you all that I have been shortlisted from over 2000 entrants for the first heats of the Sky Arts National Portrait Artist of the Year award! Emma Rimmer, producer for the programme, rang me on Monday afternoon, to tell me the good news. I confess that when I answered my mobile, having not recognised the number, and expecting it to be yet another 'mis-sold PPI' type call, I barked my name down the phone "HELLO? Sue McDonagh? Who? WHO?? Where are you from again???" swiftly followed by some massive overcompensating as Emma explained slowly and carefully who she was. Groan. I bet she thinks I'm totally bonkers now. But anyway - let me tell you about the competition. In the first instance, entrants were asked to send in a self portrait, together with other work of their choice. From those first 2000 (two thousand!!) entrants, there are now 84 artists, that's 21 for each region: England, Scotland, Ireland and Wales. The first heat for me takes place in Cardiff in early July, where I will be arriving about 7am, and at sometime during the day, will be producing my masterpiece (gulp) of the unknown sitter, within the allowed 4 hours. Filming will be going on til the evening - so I can only imagine all the stopping and starting and moving about and chatting etc which will no doubt be occurring during that time. From each of the 21 artists, a panel of expert judges will select 4 (I think) artists to go through to the next level. That heat takes place abroad, and the artists are whittle down further until the finals, which will be held in London. The winner will go on to receive a £10,000 commission to paint author Hilary Mantel. The portrait will hang in the British Library. Luckily for me, I've been demonstrating to Art Societies for years and I rather enjoy the adrenaline of 'performing' in front of an audience. 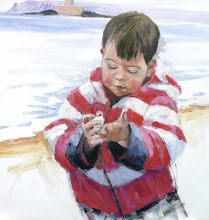 I used to sit on the sea-front at Porthcawl and do portraits on the spot for a fiver many years ago! I chose acrylic as I wanted to use something that I could express myself in rapidly. Oil is lovely, but takes so much longer to paint - and there wasn't much time to actually submit the entry. 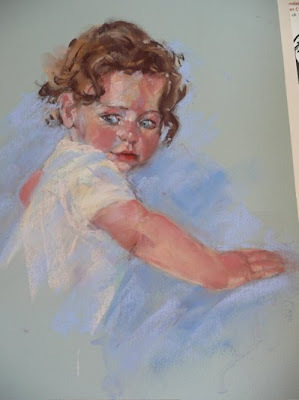 Being so used to painting children, with their round little features and soft contours, it was quite a challenge, not to mention a bit unnerving, to be inspecting my own lines and wrinkles and hollows! But after a little while, I found myself just looking at the collection of shapes and colours, and the usual thousand thoughts that go through my mind when I paint "what's this colour, is this in the right place, is this edge soft? does it go forward or back? where is in relative to this bit" etc kicked in. I think it's to do with how your brain processes a face or something. Whatever it is, it's a reliable signpost for me! There's a definite buzz in getting to that point. I'm so excited about it, I've hardly slept since. Remember me? I know, it's shocking. I never write, I never phone, I JUST DON'T CARE about you all do I. NO excuses, I'm a Gemini, what can I say. Although even I was quite interested to read my last post (almost TWO years ago, she notes, crumbling with guilt) in which I mention my health issues. The blocked sinuses and eventual chronic and maddening barking cough attached themselves to me like persistent fleas to a dog, I was diagnosed with 'adult onset allergic asthma' and prescribed a cocktail of stuff to stick up my nose and inhale. And the cough at least disappeared. I tried to be drugfree and organic- I really did. The only dairy I allow myself is the occasional fat free yoghurt and blob of mozzarella cheese. So now I'm practically living on fresh air (happily imbibed via a full face helmet - but that's another story), I've lost a stone and a half (woohoooo) and I look soooo much better - but I'm floating the national debt with my tissue buying habit. So, time to unearth the puffers and squirters once again. 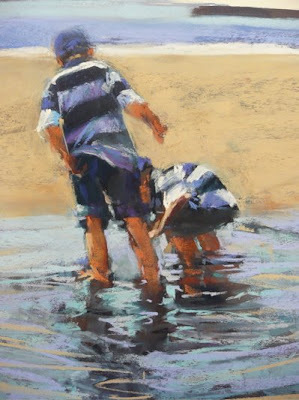 These little boys were a delight to watch and draw, hunting for little starfish in the rock pools. This painting is in pastel on paper. Funny how sometimes I want to write daily, in fact almost NEED to post daily, and yet sometimes chunks of time drift by with - well, nothing that I want to say. Mainly lately, this has been because I've felt generally under the weather and quite cranky and grumpy about it. Nothing serious, simply a relentless series of sore throat/blocked nose/cough/tiredness and general lack of get up and go. This is turn has made me feel - well, a bit depressed. Not clinically depressed, but, you know, like I'm dragging my own little black cloud around with me. Totally unlike me. Since I've been back, I've felt my energy returning slowly, although I'm still unaccountably very prone to tiredness - and don't even think about telling me it's my age, grrr... I've got on with some really nice work which I'm pleased with, sales have rocketed, and things are looking generally much better. I just bought a new van, and I am thrilled with it! it's a Romahome Dimension 2, dinky - only 16ft 4", with shower, loo, fridge and cooker etc, fantastically well set out and just perfect in every way. 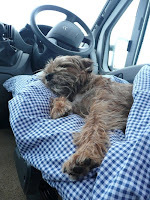 I road tested in Dale, Pembs, the weekend after I collected it, slept in all the beds - enormous double or 2 singles, had a shower, used the oven, grill and burners, and the diesel heater, and it was all wonderful. And it's crowning glory is, I've had it signwritten - by Harrisgraphics in Porthcawl, and now it looks really funky to boot. See if you can spot it!!!! I'm planning to get out more and paint, staying away from home. More pochades! I'm hoping that by directing traffic to my website, people will choose to buy online rather than in person from my gallery, which isn't open when I'm not there. That way, i can get out more and paint. That's the plan, anyway. My Nordic Walking Blog - a good laugh!